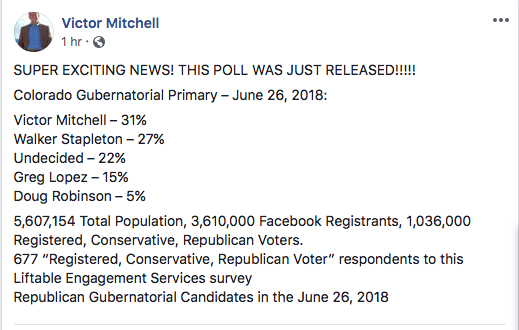 According to a new…Facebook poll, or something, Victor Mitchell is totally winning the Republican race for Governor. That "Western Journal" is like a more genial Breitbart. Definitely an alt-right media outlet. Wow, I missed Trump being detained. Hope someone will post the mug shot. Judging just by the ads, I think Mitchell has run a much better campaign. But I bet on the Titanic against the iceberg — and gave 2 1\2 points!